It’s been awhile since we pointed out the failing of society. With all of the governmental fails distracting us from sports-related fails, we haven’t had any items we could add to our blog (we do not discuss politics). But, this week, we can finally end that streak. This week’s FAIL is the BCS. Shocker, right? Try not to get too emotional about this one. For all the heat that the BCS has taken over the years, I have largely been a proponent of it over a playoff. 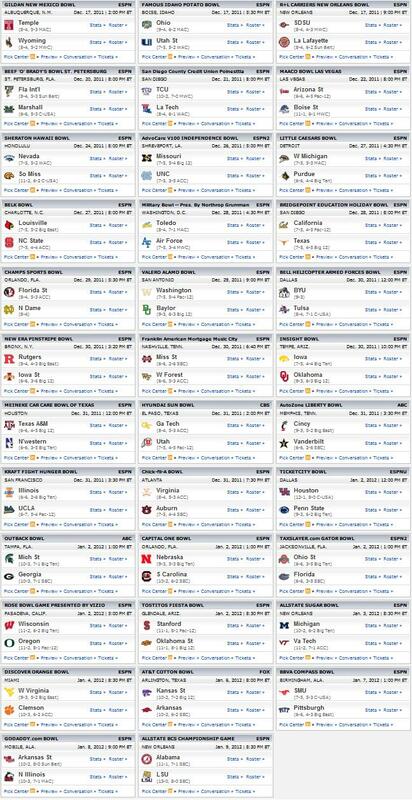 The reason I have defended the BCS is that college football has the greatest regular season of any sport anywhere. If a playoff were instituted, in my understanding, it would destroy and devalue the regular season. The most beautiful part of the college football season is that one, maybe two, maybe three weekends a year where the latest “Greatest Team of All Time” loses to some unknown, some huge underdog, or some rival, effectively ending that team’s national title hopes. Although it’s not a grid, the regular season is a national championship playoff because, just like a playoff, one loss can take you out of the hunt permanently. By and large, the BCS gives us a matchup that we want–maybe not THE matchup we want, but at least one better than the old split championship system with bowl allegiances for certain conferences (e.g., Nebraska and Michigan splitting national championship honors in 1997 because Michigan was forced to play in the Rose Bowl). And, in the end, the national champion is usually a team that everyone agrees on (except for the AP splitting from the BCS in 2003 to give the championship to USC instead of BCS winner LSU – see http://en.wikipedia.org/wiki/College_football_national_championships_in_NCAA_Division_I_FBS for references). But this year, the BCS has failed. Well, I should caveat–it’s not the BCS that has failed. 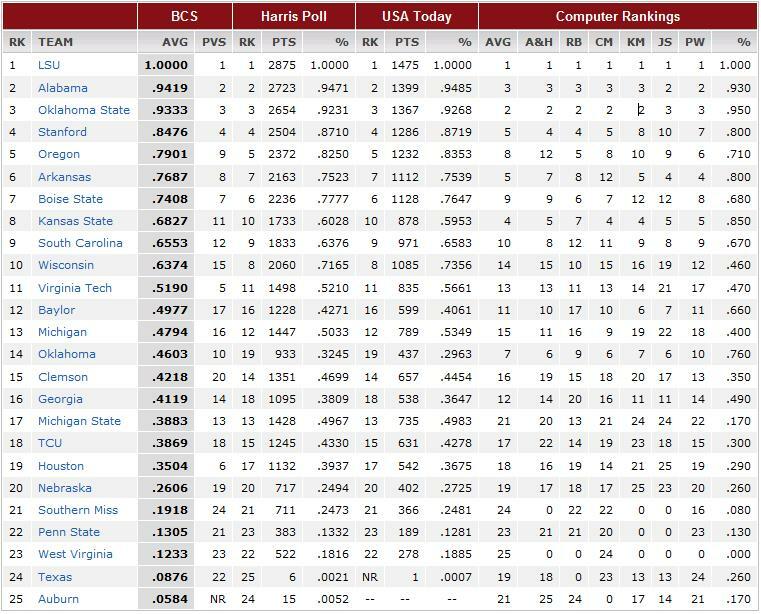 It’s the implementation of human polling in the BCS that has failed. This year’s BCS national championship will feature a rematch of a great game from the regular season of college football, LSU and Alabama. Both teams are defensive juggernauts, Alabama’s only loss coming in the overtime game against LSU. Indeed, people were pitting these two teams for a national championship rematch even before the first game was played. And that, my friends, is precisely why it SHOULDN’T happen. By putting LSU and Alabama in the national championship game, we’re saying three things that are completely antithetical to the BCS working at all. First, we’re saying that the first game didn’t matter. If you can play a team, lose the game, and then play that same team again for the championship, it means that the first game didn’t matter. for all the hype and hooplah about the “Game of the Century,” at the end of the day, it didn’t even matter! The result would have been exactly the same had the game not been played or had the outcome been the opposite, with Alabama beating LSU! There are 119 FBS teams that each play between 10 and 12 regular season games. There is no way all of those teams can play each other in a meaningful way, so why do we have games on the schedule that don’t matter? Why did we play this first game? Basically, we’re saying that Alabama deserves two bites at the apple while another team (Oklahoma state) never gets a shot. Moreover, it actually penalizes the winner of the game because LSU had to go play the SEC championship game–which it might have lost, a la Oklahoma and Nebraska losing (in different years) several years back while Alabama could sit on their couch and wait to be named a competitor for the national championship game. And even though Oklahoma State destroyed its rival Oklahoma–which is a solid team and one that OK State has not beaten in years–there is effectively nothing they could’ve done to get into the game. Second, it means that no conference other than the SEC matters. It goes against what bowls are about, which is pitting conference against each other. Yes, LSU beat West Virginia and Oregon, and Alabama beat Penn State in non-conference play. But Penn State didn’t win its conference, West Virginia won its conference but is in what is probably the worst conference in America (and I’m including the MAC and the Mountain West in that analysis), and Oregon won a conference championship over a UCLA team that went 6-7 and only managed a streak of two wins in a row! Non-conference schedules are really not the point I’m trying to make here–really, it’s about the bowls. The whole purpose of a bowl game is to match conferences that we don’t see playing each other. The reason that the Rose Bowl always matched the Big10 champion against the PAC champion is that those teams NEVER played each other. And that is how all bowls are supposed to be–a matchup to see how the conferences would fair if they played against each other in games that we rarely see. However, we see LSU and Alabama play every year! Look at the list below of this year’s bowl games. The ONLY one that includes teams from the same conference is the national championship game. The final problem is that you are giving a team that didn’t win it’s own division of a conference–let alone the conference itself–a chance to call itself the champion of the whole nation. I fail to see how it’s reasonable to say you are not the champion of your own league but, at the same time, you’re the champion of the world. This actually is not a problem of the BCS itself. Looking at the chart below, 6/8 computers ranked Oklahoma State ahead of Alabama. The problem is, both human polls ranked Alabama ahead of OK State. Why? Really? How do you assess that? Are you omnipotent? Or is this just your opinion? I have a bunch of computers that tell me OK State is a better team than Alabama. I’m pretty sure computers don’t have any single conference bias. Here’s what I know: I’ve already seen LSU and Alabama play, and LSU won that game. I haven’t seen OK State play either of those two. Does it make any sense at all to see LSU and Alabama play–which we’ve decided on the field already–instead of seeing OK State play LSU, a matchup we haven’t seen yet. Yah, OK State may get destroyed by LSU, but at least we wouldn’t be sitting around wondering if they could beat LSU. We already know Alabama can’t–in fact, DIDN’T! Why do we need to see that they can’t again? I’ve got a great idea–why don’t we just scrap the entire season. Take LSU and Alabama and have those two teams play every week. Forget about who wins each game. Just take the last one, and whoever is the winner will be called the national champion. Alabama’s offense is terrible. Who decides which is more important? Last time I checked, the game is about scoring more points than the other guys, and OK State scores A LOT OF POINTS. Oklahoma State lost to unranked Iowa State in overtime. If they wanted to be in the national championship game, they should’ve won that game. While it may be true that OK State would be a lock for the national championship game had they beaten Iowa State, the same goes for Alabama–they would be a lock if they had beaten LSU. Now I know you’re going to tell me that LSU is better than Iowa State, and that’s definitely true. But OK State lost in double overtime on a call that kind of screwed them. It was on the road in a hostile environment on a night when things didn’t go their way, and right after learning that a prominent coach had died tragically. Alabama lost at home by missing four (not one, not two, not three, FOUR) field goals in the game against LSU. Those comparisons at least balance the losses a bit, if not tipping in favor of OK State. But the caliber of the opponent to whom a team lost should not be the determining factor for all things. The caliber of the teams that you beat should also matter, and OK State beat great teams (Baylor, Texas–heck, even Oklahoma is ranked 6th by the computers with three losses!). The fact that OK State won its own conference (Alabama didn’t win its own division) should count for something as well. They have a great QB, they have the top WR in the country, and the body of work they put together is more deserving than Alabama. While that is opinion, it’s the only way this thing can work. So, to the BCS, we solute you. You FAIL, and this time, you’re failing one of your biggest supporters. With the popularity of our Fail of the Week (FAIL) 1, I present to you, this week’s epic FAIL. This week’s FAIL focuses on Rashard Mendenhall, runningback for the Pittsburgh Steelers. Of course, in his wisdom, Mendenhall ignored the fact that slaves were physically beaten and oppressed–not to mention unpaid–while he earns more in a year than I probably will in my career. But, of course, when you’re stupid, you’re stupid. Many wrote this off as a dumb comment–or, perhaps, were too cowardly to comment, given that this country has a hard time dealing with race relations. But Mendhenhall now has drawn the ire of the whole country. In an amazing day in American democracy–the subject of this week’s POTW–the villain of the worst disaster in American history was taken down by Navy Seals. Osama bin Laden, the pursuit of the world’s armies for the past decade, was shot in a firefight early this week. Let me explain to you, Rashard, how the people of this country can HATE a man they’ve “never heard speak.” He killed 4,000 of us. That’s all I need to know to HATE him. And while I don’t think it’s good for our country to relish the death of anyone, I cannot deny that bin Laden needed to die, if for no other reason than he was our sworn enemy. But, looking to Stupid Tweet #2, I have to say that you need to quit football and check into a mental health institution as soon as possible. You have obviously taken far too many hits to the head. Have you not seen the videos? I’m looking forward to the signs in the audience when you’re in Baltimore. The 8 road games this year are going to be fun; I wonder if the fans will chant “TERRORIST, TERRORIST, TERRORIST” for you. You probably should leave the tweeting to the professionals. So, to you Rashard: you are an epic failure.